Google Docs comes with a very helpful integrated spell checker that stops you from making glaring errors in your reports and essays. It runs off your own personalized dictionary, so you can add and edit words that get the all-clear with a few mouse clicks. Here’s how to banish the dreaded red line from underneath those words you know are right. If you spot a red spelling error flag that you know shouldn’t be there—perhaps it’s a company name or just a way of writing a word that fits in with your style guide and not Google’s—then right-click on it and choose Add to personal dictionary from the menu that appears. 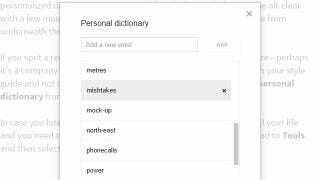 In case you later discover that you’ve been spelling “eke” wrong all your life and you need to remove a word from your personal dictionary, head to Tools and then select Personal dictionary. You can add words from here but you can also remove them by clicking the crosses on the right. Remember to hit Save to confirm. If you’ve previously told Google Docs to make automatic corrections based on your typos—turning “teh” into “the” for example—then you can disable any one of them by selecting Tools and Preferences. It’s also possible to turn off automatic substitution entirely if you want to.